As a fan, I always root for the underdogs. Why? Well, because they bring the nicest, most exciting surprises and, most importantly, because they always remind us that anything is possible. That is why, in my impressions of this year's European championship, I'd like to talk about a gymnast who surpassed everyone's expectations: Halkina from Belarus. I would also like to briefly discuss Marina Durunda's much contested bronze medal with ribbon, which she received after submitting an inquiry into the score. First, Halkina. For me, her bronze medals with both clubs and hoop have the weight of a silver medal. She also did a beautiful ball routine. 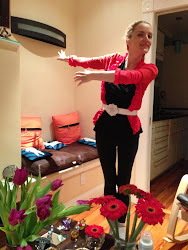 Her ribbon routine was well-performed but I think there is still some work to be done in terms of apparatus handling. 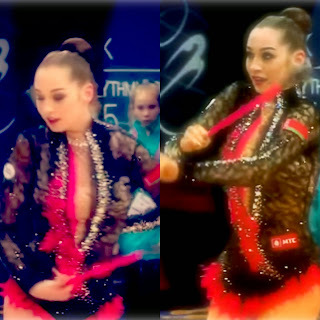 However, I think that even with ribbon, Halkina outperformed her illustrious teammate Staniouta. Halkina is still "second" on the Belorussian team, but, to me, she is the best second gymnast there is. One thing I would definitely like to wish Halkina is to continue to be expressive and to enjoy the music that accompanies her routines. we really saw this from her with clubs at this championship. While in the past she may have focused on just completing the difficulties in this action-packed routine, I think this time she really danced to it as well and felt every beat. When I look back on all the club routines performed at the Europeans, I believe only Kudryavtseva beats Halkina in terms of originality and expression. The only reason Halkina is not getting more scores over 18, especially for her awesome hoop routine, is because she is still relatively new to the big carpet of international gymnastics. Even though she is still new to the elite, I am not sure why Halkina placed third with hoop and not second: her routine really shows the best there is to show with this apparatus, both in terms of risky throws, but also general handling of the hoop with constant movement and a lot of originality. This hoop is better than both Rizatdinova's and Staniouta's. Halkina is quickly becoming one of the most interesting and complex gymnast her country has shown the world. Now, about Durunda's medal in ribbon, which she received after contesting the score. This is a huge victory for Durunda. She has been performing one of the fastest, most difficult and most exciting to watch ribbon routines in the world. She makes this routine go very smoothly as the ribbon is never touching the ground and moves from one difficulty to the next with terrific amplitude. The ribbon is telling a story or perhaps painting a picture for us. The fact that the judges gave Durunda this bronze even though this meant depriving the host country of another medal really shows how powerful and deserving Durunda and her coach are. They did the right thing by contesting the score! And although Durunda's victory means one medal less for Halkina, this much contested bronze is a real breakthrough for Durunda, who has really grown as a gymnast and shown very strong apparatus work, a lot of artistry in addition to her meticulously clean balances and pivots. Well done, Marina, welcome to Europe's the world's top 3!